Reading Cafe: Desi Brides in Western Gowns! Desi Brides in Western Gowns! The Indian brides till date were seen in the traditional bridal wear for all their ceremonies. Their selections were always centered around the lehengas and the sarees for the engagement, and pheras. 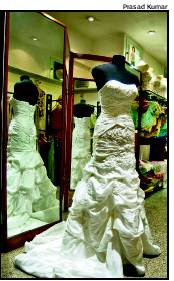 But the modern bride (latest fashion trend) has now decided to expand her horizon and wardrobe to include the western "gown", complete with trails and veils, which can be worn in ceremonies abroad. This bridal gown can be worn during the ring ceremony and the more traditional outfits are worn for the actual wedding ceremony. This change of mindset of the desi bride has come with the entry of international clothing chains into the Indian market. As a result, the Indian Hindu brides are now beginning to adopt this fusion of Indian-western wear for their wedding ceremonies! What Do Women Look For in a Relationship? Corporate Education a New Trend in India! Robot Will Now Teach Dentists to Feel Pain!